Often the cause of pain is obvious, a broken leg, or a bruise. But there are times when the source of pain is unseen, for example lower back pain or in more complex conditions such as Fibromyalgia. Pain that comes and goes – is called Recurrent or Intermittent Pain. Acute pain is a way of our brain telling us something is wrong or maybe causing us an injury, such us touching a hot pan. Our brain sends a signal so that we pull our hand away from the hot pan. Other minor pain helps to remind us not to do too much, for example pain of a broken leg will remind us to rest until it is healed. Persistent pain often serves no useful purpose. These pain signals get stuck in a ‘Red Alert’ state in our warning system and our central nervous system can be over sensitised. Over time, this affects what we can do, our ability to work, our sleep patterns. It can have a strong negative effect on our family and friends too. Pain signals use the spinal cord and specialised nerve fibres to travel to our brain. This involves our whole body. It is more than just a network of wires. These fibres also work to process the pain signals. All together they work like a very powerful computer. Sometimes this computer system can go wrong. The messages get confused and the brain cannot understand the signals properly, which can lead to chronic or persistent pain. Part of this process is linked directly with the emotional centre in the brain, the limbic system. Our emotions play a huge part in how we are affected by pain. When we are depressed, anxious or angry, our pain will be worse. The opposite is true when we are feeling happy and positive, our pain decreases and we feel better. This shows that our pain is complex and is in both our mind and body – the mind body connection. To treat pain we have to treat the whole person with an holistic approach. I use a combination of the following therapies to rebalance each of the areas above. 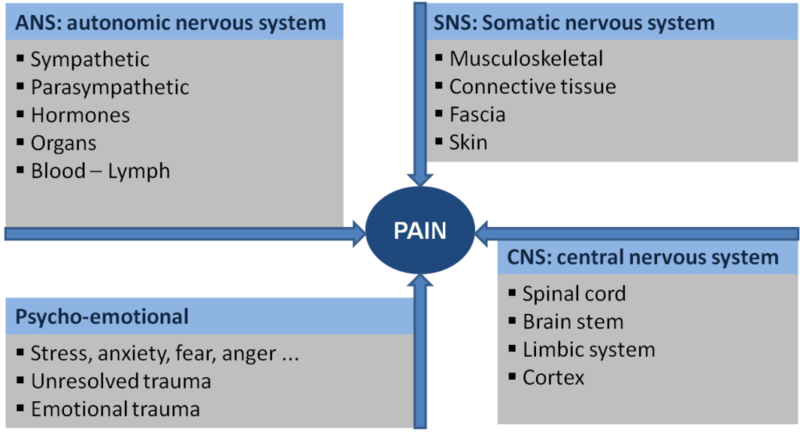 Pain is a multi-faceted condition that require a multi-disciplinary treatment approach. Nerve Reflex points are stimulated to desensitise the over sensitised Central Nervous System and rebalance the limbic system and musculosketal system. Points are also stimulated in the Autonomic Nervous System, to bring the body into a Parasympathetic state, in this relaxed state the body can do its own healing. Nerve Reflexology has reflex points that covers every system in the body and brain. When you are feeling happier your pain is less, this is why is it so important to look at every aspect of your life and what is needed to be addressed to bring about happiness and vitality. Wellbeing coaching is a holistic approach to examining how your personal wellbeing interacts with your values, goals and motivates you. It addresses the 8 key areas, Nutritional Health, Energy Levels (Thyroid & Adrenals), Emotional Health, Environment, Lifestyle & Pace, Relationships, Movement and Life Purpose. Emotional Freedom Technique (EFT) is a self-help technique that involves tapping near the end points of “energy meridians” located around the body in order to reduce tension and promote a deeper mind-body connection. EFT helps to release past traumas and pain that can get trapped in the body’s energy field. How can you work with me to reduce your pain? I offer Wellness Packages that cover Wellbeing Coaching plus all the Complementary Therapies that I practice. Wellness Packages can be tailored to your individual needs.